They’ve apparently figured out a way to get into the back yard – when I got up this morning to water they have eaten every squash and plant there was. They devastated my lima bean patch. They trampled my swiss chard – apparently they don’t like it much. Upgrades. Designed to confuse on purpose??? To those of you who are subscribed, I apologize – I posted late last night, it was a post about putting one of my spinning wheels up for sale but after I posted it I realized if I sold it without having a replacement I would not be able to complete any yarn. Since I have to have it until I get all my holiday sales and family gift projects done, I deleted it. Sorry! Between Facebook’s ‘upgrades’ and the brand new design of WordPress, I waste minutes each time I visit trying to figure out what is where, and why. Do the designers just have a need to change things for change’s sake??? That is all. Just venting and apologizing for being stupid. New jobs are going well, but I need to cut back hours soon, no time for my business. Got a wood stove, my contractor is flaking on me so it’s still not installed. It is however in the living room with 99% of the parts. The cat thinks I bought a nice cool bed just for him…he’ll be in for a surprise if we ever get it installed and fired up! Our old stove exploded last night. Or more specifically, the aged and brittle tempered glass that covered the oven door did. Mr. Tin Foil got up to get some water; he didn’t turn the light on because he didn’t want to wake me. He walked into the kitchen and hit the oven handle with his thigh, which because of his balance at that point spun him into the door. His knee was enough force to shatter the fragile glass, apparently. The POW! woke me up in time to see glass shatter everywhere. 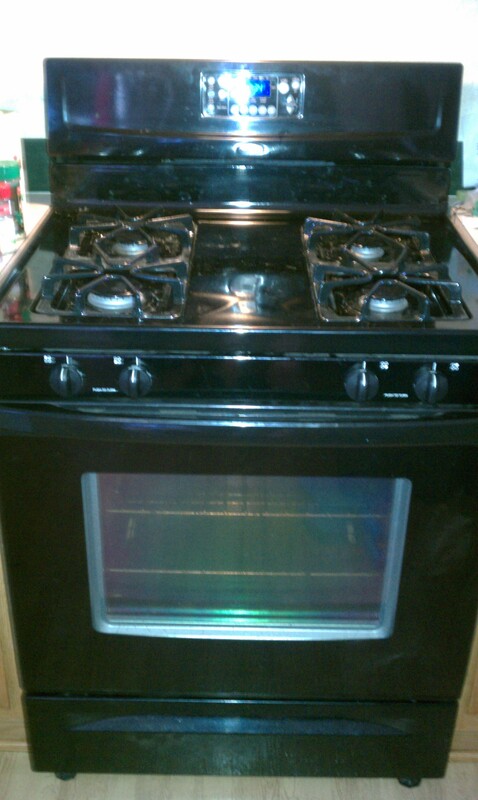 Above is our ‘new’ stove. It’s 3 years old, bought from a family with six kids who upgraded to a much larger stove. This has been (mostly) Mr. TF’s labor today, getting it installed and properly adjusted flamewise. I like it! I hope it lasts as long as our previous stove did; while we only had it for 4 or 5 years, it was made in the early 80’s and 30+ years is a long time for that glass to last. ETA: Mr. TF did most of the work getting this up to speed; I kept out of his way. Which is unusual for me, because I feel obligated to help in a project like this. What else was unusual is that we did NOT have any arguments during this whole thing! Maybe I should stay out of the way more often…?